The agile gibbon is found in the tropical rainforests of Thailand, Malaysia, and Indonesia. Fur color varies, ranging from black to red-brown, depending on the subspecies. All subspecies have white brows, and males are easily recognized by their white or light-grey cheeks. Males are also larger than females. These apes are generally small, and the average weight of an adult is 8.8 to 3.2 lbs. Gibbons do not have tails but have extremely long arms and fingers which helps them hang and swing from branch to branch high up in the trees and at a very fast pace. Agile gibbons spend much of their lives high up in the trees of the rainforest and rarely come down to the ground. They are social and prefer to remain in family groups of four. They defend their territory by singing and can be heard singing duets early in the morning to defend and establish their territory. When the singing is not enough, they are known to chase intruders away. Diet consists of fruit, leaves, and insects. Gibbons are monogamous, meaning males and females come together and remain as a pair for life. The female gives birth to one young after a gestation period of seven months, and both male and female help with caring for the young. Pairs may reproduce up to a total of six young in their reproductive lifetime. In captivity, this species can live up to 44 years but may not live as long in the wild. Three subspecies of agile gibbon are listed are endangered: The Bornean white-bearded gibbon, H. a. albibarbis, found in Southwestern Borneo (some scientists believe it may be a member of its own species group, Hylobates albibarbis), the Mountain Agile Gibbon, H. a. agilis found in Sumatra and the highlands of South Peninsular Malaysia, and the Lowland Agile Gibbon, H. a. unko found in Sumatra and the lowlands of South Peninsular Malaysia. 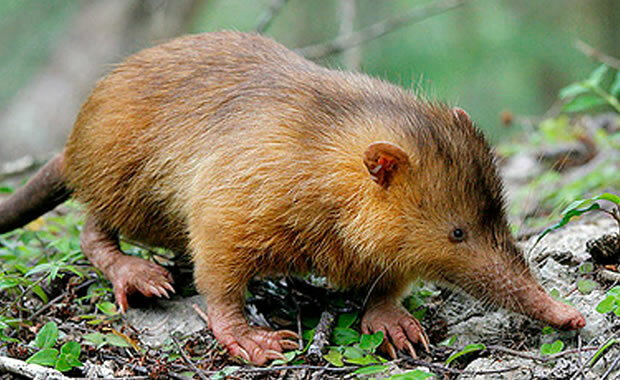 This species is threatened with extinction due to lost of habitat to massive deforestation for logging and agricultural development. 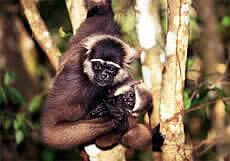 Game parks and reserves have been established to preserve the species, and some agile gibbons are bred in zoos. Copyright Notice: This article is licensed under the GNU Free Documentation License. It uses material from the Wikipedia article "Agile gibbon". Glenn, C. R. 2006. "Earth's Endangered Creatures - Agile Gibbon Facts" (Online). Accessed 4/24/2019 at http://earthsendangered.com/profile.asp?sp=1631&ID=3. Need more Agile Gibbon facts?